At the end of last year we didn't plan to go to Europe. Our thoughts were that we'd take the ferry (that then existed) from Colombia to Panama and drive North. We'd leave Blac (the motorhome) in Mexico or USA and fly to Australia for my friends wedding and, while we were there, we'd turn an Australian bus we'd picked into an Australian motorhome. Instead, (in January) my knee became excruciatingly painful, without any known injury, and I knew that the Venezuelan doctors prescription of painkillers and ice wasn't really helping. So, I told H that I wanted to fly to Australia or Europe to see about my knee. So, we flew to Europe and saw H's doctor. When the doctor saw the CT scan he said bone was touching bone and I'd need surgery. With this news, H flew back to Colombia and arranged Blac to be shipped to Belgium. I hadn't seen a Specialist yet, but I had an appointment to see the Orthopaedic Surgeon about a month after seeing the GP. In the meantime, I got bored and I discovered that although it was extremely painful to walk, it didn't hurt to cycle. So I went cycling, just because that way I could see a bit of the world. When I finally got to see the specialist he said he didn't want to operate, that I was already getting better with the cycling and he wanted me to keep cycling. So, when Blac arrived in Belgium we went to Holland and bought some used Brompton folding bikes that could travel with us (Holland because they have more bicycles available). We chose Bromptons after seeing the quality of their make. H originally only thought to get a bike for me, but I insisted we should get one each. It's been great! Now when we do go to cities we can park at a campground nearby and cycle in. Other times I might cycle alone or while H jogs in some rural area. H tells me that he's very happy that we got a bike each, he never thought he'd enjoy Europe as much as he does now. 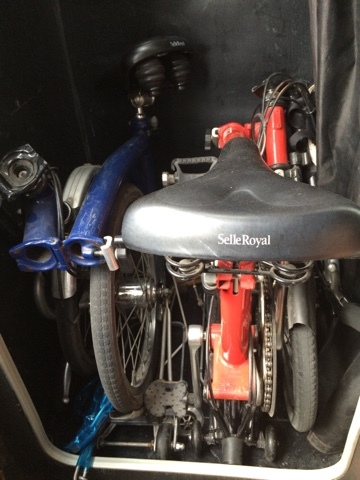 The other great thing about having Bromptons (which fold to a smaller size than many other folding bikes) is that the 2 of ours fit side by side in the shower. Perfect!